The initial enquiry about the artist was suggested by Janice Woolley, who believed Williamson Art Gallery & Museum’s ‘Vessel of the Yeoward Line, Liverpool’ to be a painting by her great-grandfather John Francis Josse, as it was listed in the collection as by ‘J. F. Josse’. The Williamson Art Gallery & Museum asked members of Art Detective for help in the verification of the artist’s name. Michael Charles could not trace Josse in any of the well-known catalogues for steamship portrait collections, nor did he recognise the ship as one of the Yeoward Line. 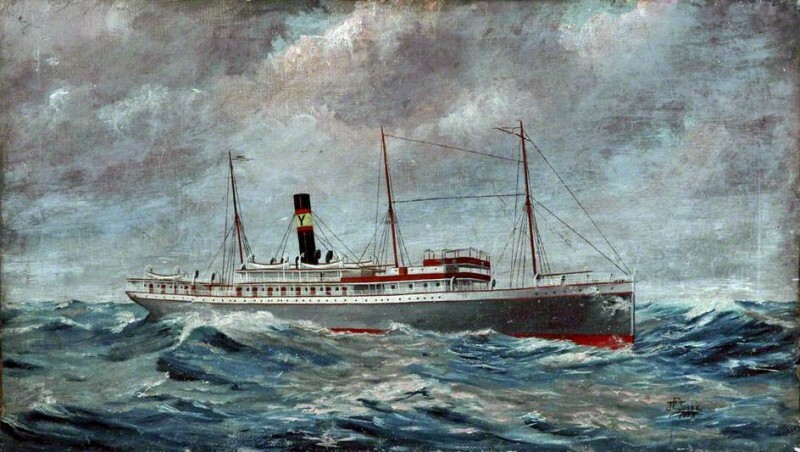 Cliff Thornton noted the date of the painting, 1923, to be an important year for the Yeoward Line, the launch of their last ship ‘Avoceta’, a sister ship to ‘Alondra’. The Line operated between the Mersey, Liverpool and ports in Spain and Portugal, which prompted Charles to enquire about its acquisition. Cliff Thornton then traced a John Francis Josse, seaman, in the 1911 Liverpool Census, employed by Mersey Docks & Harbour Board. Paul Kettlewell confirms Josse’s birth in Liverpool, 19 July 1874, and at his baptism in 1879, his father Amiable Josse, is described as a mariner (deceased). In 1890, John wins a prize for rowing on the ‘Indefatigable’, a training ship for orphan sons of Liverpool sailors, and dies in 1956. His son, also called John Francis Josse, is born in 1905. Amanda Draper confirms purchase by the Williamson in December 1984, but not the source, and Charles wants to know who is the artist – grandfather or great-grandfather? The Williamson confirms that it was acquired from a local person named Robinson, from West Kirby. 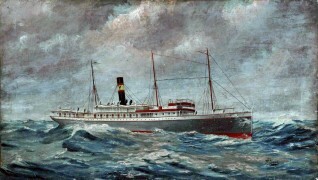 Pieter van der Merwe confirms that Josse is not listed on the National Maritime Museum collection database, but Bobb Todd of the Historic Photos Section identifies the ship as a painting of the ‘Andorinha’ built in May 1911, sold to the Pacific Steam Navigation Co Ltd, in 1929 and renamed ‘Champerico’; sold again in 1934, to Rafael Torres y Cia, S. A. and renamed ‘Vina del Mar’. In 1960 it is reduced to a store ship hulk at Puerto Chacabuco, Chile, and blown aground at Puerto Chacabuco, where her abandoned hulk was still extant as late as 1997. He concludes that with no further advance on the artist and from the evidence presented, it is likely that the Liverpool-born John Francis Josse (1874–1956), identified in 1911 as a seaman working for Mersey Docks & Harbour Board, is the artist. He is probably an amateur painter of the ‘pierhead’ sort or because he painted ships, in which he worked, but his namesake aged 18 in 1923 is not excluded absolutely either. Is this work of 'Vessel of the Yeoward Line' by John Francis Josse?